Ever have that issue where you don't have a garage and have to leave your baby outside exposed to the elements? Have a classic that you keep inside which only comes out for those special events and are looking for a bit of extra indoor protection from dust, random things falling, kiddies smashing aimlessly into the sides of your car? We're sure that you've gone to the local car parts store and seen the normal boring display of family sedan beige or gray car covers and not offering up much in the way of protection that you demand for your VW. 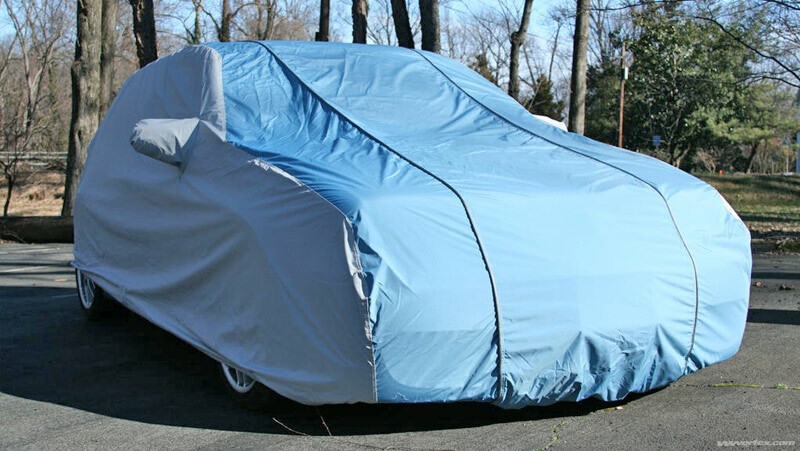 Well a solution is in hand for those of us that would like to have a bit more of a customized indoor and outdoor car cover option. The accessories team at Volkswagen of America (VWoA) tipped us off recently that they have begun a program for custom car covers for the entire VW line. 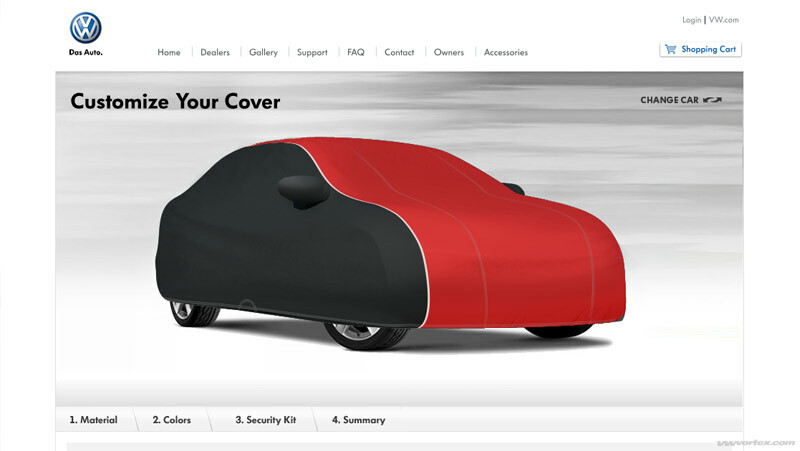 VW Accessories now offers the ability to go online through www.vwcarcovers.com to configure various color combinations and patterns that suit your style. Things like piping, stitching colors and cover colors for two panels (side and roof) can be customized to your liking. The configurator features covers for almost every model that VW has had. In other words, the classics both aircooled and watercooled are included in this customization program and haven’t been left out by VW Accessories. The program is even going as far as carrying something the folks at VW call "universal" gift covers with a giant Red bow on it for those special occasions you want to surprise someone maybe let's say with a new Golf R. These covers will be offered not only through www.vwcarcovers.com, but through selected VWvortex.com vendors and through your local dealer. Our experiences with both the indoor and outdoor covers have been excellent. For the indoor cover we selected a dark blue cover with silver piping that would match our Project Rabbit’s Indigo Blue paint job. The fleece lined cover is perfect for the paint on the car and has already proven itself in saving the car from a couple of near misses and door dings in the garage. As you can tell in the photos as well, the cover fits snugly over the car and fit and finish are top notch and provide quite decent indoor protection. We decided to go with a blue as well for the outdoor cover. Same as on the indoor cover, the fit is snug which is especially important for an outdoor cover where the wind can easily blow your car cover off and make for a perfect sail. With the outdoor cover, we decided to have a two toned blue on top and silver on the side to reflect the profile of the car, in this case a 2004 R32. The top and the sides are customizable to your color choice and come with a VW emblem on the front. This cover is also what VW calls “Stormproof” so is ideal for all season use and repels water well. The exterior cover for the R32 featured a few extras we didn’t expect. It has a cut out for the rear license plate, probably useful when parked in public places and the city requires you to display your plate, as well as Nomex lining stitched into the lower rear area where the exhaust tips are. So as you can see the cover program is pretty inclusive and the product itself of high quality based on our experiences with both the indoor and the outdoor covers. Pricing is also very competitive based on the level of customization. 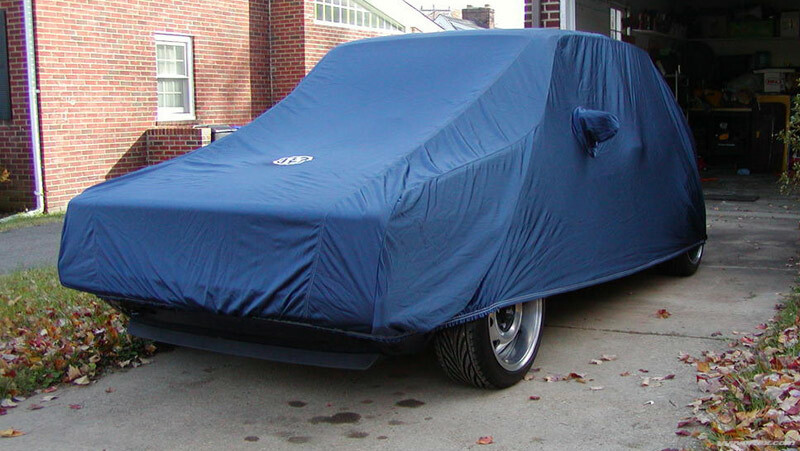 Kudos to VW Accessories for coming out with www.vwcarcovers.com idea and catering to the owners that would like just that little bit more protection for their VW wrapped in a custom cover.